A reader asked me how Midnight Cami stacked up to Bell-Bottom Blues on my Fall 2015 Comparison post and I promised I would update the post with pics. 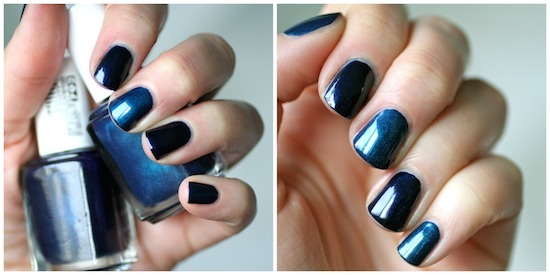 I hadn't even thought to compare these two polishes so I was glad to be asked. My initial thoughts were that Bell-Bottom Blues was quite a bit lighter and I was thinking it would be closer to Aruba Blue, but in comparison it's quite a bit closer to Midnight Cami than I would have thought. Bell-Bottom Blues is a bit lighter and keeps looking "blue" even in darker lighting situations, whereas Midnight Cami can look black in darker light. 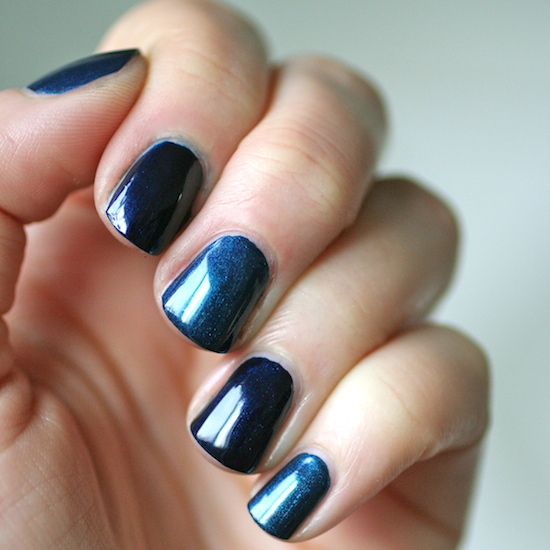 In regular daytime light, Midnight Cami is a true navy with fine blue shimmer, but the shimmer in Bell-Bottom Blues is much more apparent. Both polishes have a really nice formula and are easy to apply. They both made it into One-Coat Wonder round ups, with Midnight Cami in Part 1 and Bell-Bottom Blues in Part 2, although I will confess that I updated Part 1 to say that my older bottle of Midnight Cami was indeed a one-coater and my fresh new bottle needed two coats to get opaque. Either way they both have great formulas, and are mostly easy to apply, although I suggest going slow and steady when applying both of these polishes. As you can see in the pics above, I got a bit of Midnight Cami on my cuticle and used my usual trick of pure acetone on a small angled brush to clean it up and it definitely did not want to come completely clean, leaving me with blue cuticles (ugh, don't look!). I would also suggest using base coat (maybe even two coats of it) to prevent both polishes from staining your nails. Midnight Cami is the worst for staining.